Polymer Solutions International Inc. is a world leader in manufacturing and selling material handling products throughout a number of industries. We specialize in designing innovative solutions for a wide variety of applications that help improve supply chains, reduce costs, and protect products and handling equipment from ongoing issues. Founded in 1997, we pride ourselves on our engineering expertise and strong customer focus. Polymer Solutions International wants to be a supplier and resource for your material handling needs. As the world’s population continues to grow, the words, “Reduce, Reuse and Recycle” have taken on new significance. Reducing a company’s environmental footprint, being a good corporate citizen and achieving legitimate sustainability improvements have become the price of entry in today’s business environment. For over twenty years PSI has helped its customers reduce their environmental impact and reduce their operational costs at the same time. PSI’s focus on returnable/reusable packaging solutions help customers drive out packaging costs, improve manufacturing efficiencies, and greatly reduce materials going to landfill. PSI’s ProStack modular rack system for the bottled water industry, for example, eliminates disposable corrugated and shorter-lived alternative packaging, improves worker safety and greatly increases the useable life of the primary package, the reusable bottle. In fact, some of the first units PSI manufactured are still in the field today. That is a working life of over 20 years! All of PSI’s products are reusable. They are intended to be used, and reused for many years. As with any product, they will eventually reach the end of their usable life (EOL). Because nearly all of PSI’s products are manufactured with 100% recyclable materials, those items can be recycled. PSI encourages its customers to participate in our recycling programs and we continually recycle materials recovered from EOL products into new solutions to continue to help our customers meet their sustainability goals. PSI is committed to helping preserve our environment for future generations. Join us! Polymer Solutions supplies products to customers worldwide. With customers in over 110+ countries, our customer service department can help arrange all of your product needs. Our bottled water racks dominate the market – offering upright delivery, better stacking, and better storage for your bottle water distribution. 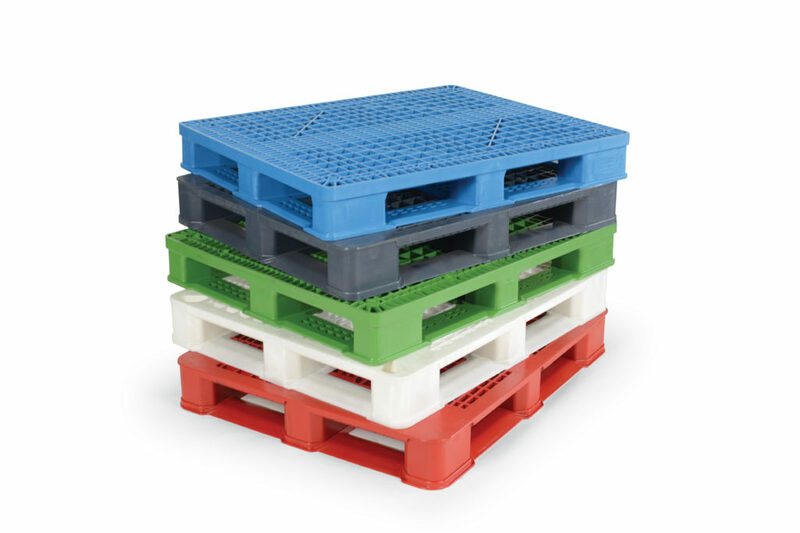 We also offer a vast lineup of plastic pallet options to fit your needs: FM approved, hygienic, one-piece, solid top, rackable, reinforced, and metal detectable pallets..
We are a world leader in material handling products and solutions, like our ProStack line of bottled water racks and plastic pallets. With the growing concern for the treatment of our planet, PSI has teamed up with our customers to help drive any and all sustainability efforts. It is important to us that with our long term customer partnerships we strive to help maximize efficiencies while minimizing the environmental impact. PSI Reusable Products are inherently built for supply chains aiming to limit packaging that heads to a landfill. Reusing our products helps our customer’s environment with the global impact in mind. Since 1997, PSI has worked with more than 100 companies located throughout the world in several industries. This experience and global knowledge has helped PSI develop a reputation companies know trust with all of their material handling needs. Our experienced engineering department is filled with experts on developing new and innovative returnable packing products. No problem is too big or small for us to help solve with you. Serving our customers is one of our greatest passions as their loyalty and commitment to our company has helped us continue to provide sustainable products and solutions to the world. With PSI’s help over the last few years, we’ve successfully converted our entire float from wooden pallets to reusable plastic pallets. I’ve had the opportunity to purchase reusable material handling products for several companies throughout my career. I could always count on PSI to provide first class products and service for all our company’s needs. Our company has been purchasing ProStack bottled water racks from PSI for over 10 years. PSI’s bottled water racks have drastically helped our company increase overall efficiency for our bottle water storage and distribution service while saving an incredible amount of money vs our old metal racks.